Deena Livingston leaves behind a broken romance and her chef job in Atlanta to spend time at her grandfather's cabin in the mountains of North Carolina. But her grandfather has an odd request: he wants Deena to teach cooking classes to the ragtag group of middle-schoolers who attend the local afterschool program, The Center. Reluctantly, Deena agrees, but how is she supposed to convince these kids that cooking at home is better than eating at McDonalds? And after all she went through in Atlanta, why is she attracted to Zack, the social worker at The Center? Can a Dr. Seuss-quoting plumber, a curly-haired basketball player, and a group of middle-schoolers change Deena's outlook on life? 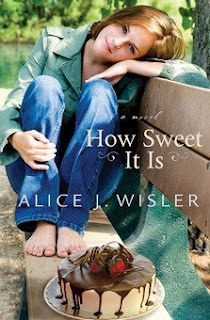 How Sweet It Is was a nice, light summer read. The characters are well written and you grow fond of them quite quickly. The character of Jonas the Eagles lyric quoting plumber is one of the most enduring characters I've ever read. He quotes just the right lyric, at just the right time and sounds unbelievably wise. This is a great tale of letting go, moving on, and embracing life. The recipes at the end were a nice surprise! Thanks for reading and for your review of my novel!